If you have decided to purchase an above ground tank, know where you’ll locate it, then you will then need to decide upon a tank colour. Sounds simple, but then choices that seem simple often end up stumping us, especially if like me, you tend to overthink on decisions. An advantage to poly tanks is that you have a wide selection of colours to choose from. The negative is that now you have to decide from the many colours available which one to get, right? This article is written to help you decide which tank colour is best for you based upon both practical and aesthetic considerations. Polyethylene water tanks come in a wide range of colours. Team Poly provide some of the largest selection of colours on the market with COLORBOND® colours to suit the surroundings of your tank: White, Smooth Cream, Wheat, Evening Haze, Mist Green, Rivergum, Heritage Green, Heritage Red, Merino, Beige, Sandbank, Birch Grey, Jasper, Slate Grey, Mountain Blue, Bronze Olive, Gull Grey, Monument and Black. When selecting your optimum tank colour, many select purely on aesthetics and how the colour of their tank will fit in with its location. There are also two practical reasons to factor in when choosing a tank colour. Darker coloured tanks absorb more heat in the Sun, which can result in your rainwater becoming warm or hot rather than refreshing (if used for drinking purposes). Warmer water also provides a better environment for bacteria to breed. Some coloured poly mixes will last longer than others in UV light. While all our poly tanks have SUPA UV technology that provide up to a UV36 level of protection (four and a half times the UV8 Australian standard for poly tanks), some colours seem to last longer than others. 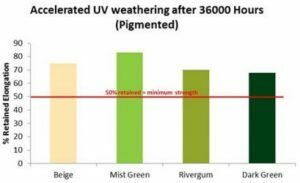 For example, in tests of intense UV weathering (PDF), lighter colours like mist green and beige seemed to perform better than rivergum and dark green. Of course, if your tank in placed in a location that is sheltered or out of direct UV sunlight, then these two reasons will not matter too much. All our tanks will nonetheless last for a very long time in the Sun, and you are covered by a very reasonable warranty of up to 25 years. Choosing a colour that complements the location of your rainwater tank will help camouflage its obtrusiveness whether places against a shed or house, next to a garden or some other surrounding. Your tank colour is one of the simplest ways to add a large water tank on your property in an aesthetically please manner. If you have already purchased a poly tank, and aren’t happy with the colour, then don’t worry! There are many neat tricks you can to with poly tanks to camouflage or hide them. It just means you might have more fun concealing your tank. Team Poly tanks offer you with a very wide variety of tank models to choose from, whether you’re after a traditional round tank, one of our unique Boabab tank designs or a slimline tank. Our range of tanks is complemented by an enormous choice of colours, with up to 19 COLORBOND® long-lasting colours to choose from. Talk to us today, we’d be happy to assist you with making the right decision.